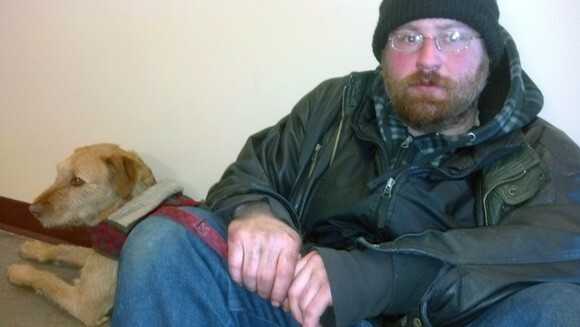 Ervin Osman and his dog Bella have been, homeless, living in a tent on the South Hill. Now, he's one of the first tenants of Catholic Charities' new Father Bach Haven apartment complex. For the past week, William Harvey, a 48-year-old homeless man dressed in a flannel garment draped loosely over an old Batman T-shirt, has had a number running through his mind: “404,” he says. It’s the number of his potential new apartment. He sits at a chair in an office at the House of Charity, the homeless shelter that has provided a place for him to sleep during the past six months. His new apartment will be right next door. He’s one of 87 people to apply to live in Father Bach Haven, Spokane’s first and only apartment complex devoted entirely to housing the chronically homeless. He’s emotional. Margie Taylor, the shelter case manager at House of Charity, hands him a box of Kleenex, just in case. If he moves in, it will be first time in six months he has had a place of his own. This won’t be a shelter, or “transitional housing” with a time-limit. As long as he pays his rent — set on a sliding scale according to his income — his place will be permanent. To be clear, Harvey hasn’t been officially approved yet. He still needs to hear back from Coast Real Estate Services for the final OK. If he gets it, he thinks it may change his life. At 2 pm today, the first two residents of Father Bach Haven had begun to start moving in. Ervin Osman, one of the first tenants, pets his dog Bella near the entryway. A red-bearded 42-year-old, he says he became homeless last December, when his funding from the post-prison education program ran out. Osman spent 11 years in prison for vehicle theft and assault charges, but says he hasn’t reoffended since 2009. Yet, his record makes it hard to get a job, or find a place to live. But he takes the elevator upstairs, opens the door, and there’s his new apartment. This isn’t a slum. His apartment has furniture pre-built into it — a bed, a kitchen table, a dresser, a microwave convection oven and a full-size refrigerator. The floors are stained concrete, and the furniture has a dark veneer of cherry. Meanwhile, two local Catholic parishes, Sacred Heart and Our Lady of Lourdes, have been donating mattresses, bed covers, toasters, trash cans, shower curtains, coffee makers and dish sets. Donated canned food sits on kitchen counter, and a Christmas poinsettia — provided by Catholic Charities — sits on the table. Five years ago, nearly 150 low-income tenants at the New Madison and the Otis hotels were served eviction notices as the troubled buildings closed. The city swiftly responded to find temporary places for the recently homeless. But something crucial had been lost: Needy, low-income tenants were spread throughout the city, making it difficult for social services organizations to target them all. But now, Father Bach Haven — named after Frank Bach, a priest of 56 years and the current president of the Foundation Board for Catholic Charities — will hold 50 homeless men and women, across 30 studio and 20 one-bedroom apartments. Catholic Charities hasn’t had to raise a cent to construct this building: It’s all been funded from $6.8 million in low-income housing tax credits awarded from the state of Washington. In recent years, available funding to help thehomeless has moved away from shelters and toward permanent housing. In this case, those housing credits come with stipulations. All tenants must have had at least three incidents of homelessness, defined by the federal government as a place considered uninhabitable. They have to have some kind of income (often through disability or unemployment), and they’ll pay 30 percent of what they make in rent. That rent, however, won’t provide enough money to keep the building operating. For a time, Catholic Charities will be using money left over from construction to pay for operations. After that, the organization hopes to find Project Section 8 voucher money to make up the slack. For Harvey, the past decade has been a rough one. Over 12 years ago, he was diagnosed with Type 1 diabetes. Ed McCarron, the director of the House of Charity, says Harvey sometimes struggles mightily with depression. This could mean a new start. It could mean a quiet place to study as he gets back into his education. Moving will be simple. He doesn’t own furniture. He has headphones, an iPhone shuffle — they sit on his lap — and a few bags filled with clothes in House of Charity’s storage. For the first time in a long time, he’ll be able to cook his own food. As a diabetic, that could save his life. Harvey says he’s been hospitalized 14 times in the last six months. “A couple times I shoulda been in a coma,” he says. For him, the chance to have a new place to live is an answer to prayer. It’s overwhelming. “I’m just… I’m just… I’m just… I’m speechless right now, put it that way,” Harvey says. He’s crying. He wraps his arms around Taylor and hugs her so hard his hat tumbles to the office floor. How much NRA money do our congress members receive?